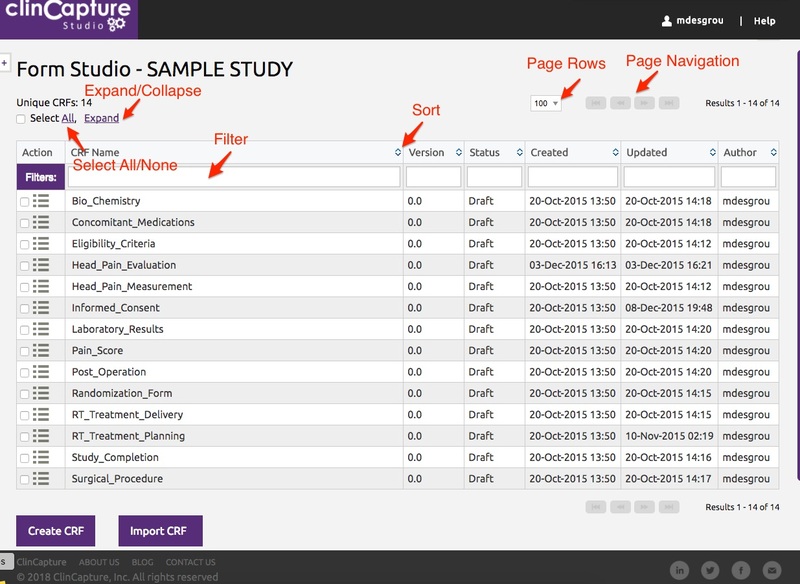 From the STUDIES dashboard, locate the desired study and click Build. Click BUILD STUDIO from the left menu. The number of unique CRFs, as well as the total number of CRFs displays. Click the checkbox to select All or None of the CRFs displayed on the page. CRFs that are not listed on the page are not selected/unselected. You can use the provided filters to filter the CRFs by CRF Name, Version, Status, Created date, Updated date, or Author. Simply start typing in one of the filter boxes. The list will filter to include those matching the entered characters. To re-display the whole list, remove the characters in the filter boxes. Click the up/down arrows to sort the list in ascending or descending order. You can also set your page size and navigate through them. If multiple CRF versions exist, use the Expand/Collapse feature so show/hide the version details. Click several checkboxes to apply a mass action: Publish, Clone, Unpublish or Delete. Only valid actions are available. For example, if the CRFs selected are already published, only the Unpublish and Clone actions will be available. When an operation completes on a CRF, the Build Forms page will automatically scroll back to its prior position and the CRF you managed will be highlighted.